Roaring Camp and Big Trees Narrow-Gauge Railroad #2, the Tuolumne, a two-truck Heisler locomotive, arrives at the depot in Felton, California in the summer of 1993. Photograph by Robert A. Estremo. Driving normal fixed frame locomotive on logging railways was virtually impossible. The irregular underground made the wheels come off the track and derailed the locomotive. One of the solutions to this problem, among the more numerous Shay and Climax was the Heisler. 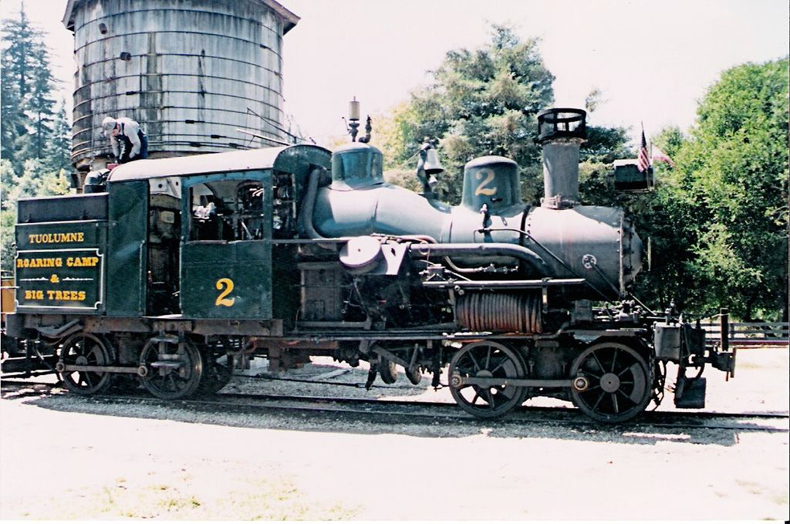 The Heisler distincts itself by its V-shaped two cylinder steam engine, driving a central crank shaft which on its turn drove one axle of each powered truck. The other axle was driven through a conventional rod. In 2007 I stumbled over an online auction of both a 2-truck and a 3-truck version of the newly produced and reworked Heislers from Rivarossi. As the old model cannot compete with the new versions. RP25 wheels, nicely blackened wheels and rods, nice add-on details instead of cast-on details and better running quailties are the most significant improvements. The coal bunker was removed And replaced by an oil bunker. This change suddenly gives the model a lot more "muscle"